The luxurious Hilton Dubai Jumeirah Resort has nine vibrant restaurants, bars and lounges, three broad categories of rooms, large swimming pool, and premium fitness centre, but above all, proximity to the beach and all important tourist attractions. 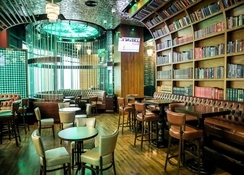 It also features services such as car rental, elevators, currency exchange, gift shop, luggage room, multilingual staff, room service, tour desk and more — the Hilton Dubai Jumeirah offers first-class hospitality, services and amenities. Set on Jumeirah Beach, the hotel is minutes from Dubai's acclaimed shopping mile, 'The Walk' and also Emirates or Montgomerie Golf Clubs. Take the family to Ski Dubai or Wild Wadi Waterpark. Business voyagers cheer; the resort is only 10 minutes from the metro station and key business zones of the city. 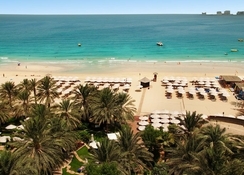 Hilton Dubai Jumeirah Resort is located on the famous Jumeirah Beach. 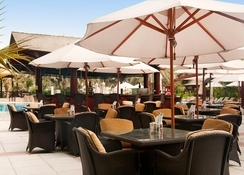 The resort is built overlooking Palm Jumeirah, the Arabian Gulf and Hilton Dubai Jumeirah Resort. It is only a few minutes away from many shopping malls such as Mall of the Emirates, Dubai Marina Mall and Ibn Battuta Mall. Even otherwise, the resort is surrounded by beach, cinemas, shopping areas, restaurants, clubs and famous bars. Also, centrally located, places such as Dubai Media, Knowledge Village and Jebel Ali Free Zone are only a few minutes away from the resort. Places of interest to check out are: Bastakiya (32km), Burj Khalifa (21km), Dubai Fountains (21km), Dubai Museum (32km), Jumeirah Mosque (25km), Seaplane (20km), Shopping - Mall of the Emirates (12km), Shopping - The Dubai Mall (32km) and Souk Madinat (9km). The Dubai International Airport is at a distance of 33km from the hotel. 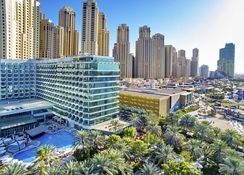 Hilton Dubai Jumeirah Resort offers three categories of rooms: Guest Rooms, Suites and Executive Rooms. The most basic amenities and services in the rooms are air conditioning, radio alarm, bathroom slippers, bathrobe, black-out curtains, complimentary beverage, connecting rooms, dining table and chairs, flexible work environment, TV with satellite connection, pay-per-view, seating area with sofa, thermostat (adjustable), 24 hour housekeeping, bathroom amenities, coffee/tea maker, room service, hairdryer, Wi-Fi connection, en suite bathroom, iron/ironing board, mini bar, telephone-with speaker phone, welcome amenity, shower, bathtub and more. Guest rooms are divided into Two King Bed Deluxe, 1 King Bed Sea View, Two Queen Beds Deluxe and Two Queen Beds Sea View; suites are divided into Family Suite Sea View, King Corner Alcove Room Sea View, King Executive Suite Sea View, King Gulf Suite Sea View, King Panoramic Suite Sea View, King Royal Suite Sea View and One Bedroom Suite; and Executive rooms are divided into One King Bed Executive, One King Bed Executive Sea View, Two Queen Beds Executive and Two Queen Beds Executive Sea View. BiCE Ristorante serves a la carte Italian cuisine (12:30pm to 11:30pm), BiCE Sky Bar serves swanky alcoholic drinks (6pm to 2:30pm), Cuban Bar also serves cocktails and other beverages in Cuban style (6:30pm to 11:30pm), H2O Pool Bar and Restaurant is the pool bar that serves snacks and alcoholic and non-alcoholic beverages (10am to 6pm), Lobby Lounge Axis serves hot and cold beverages in the afternoon, Oceana Restaurant serves theme breakfast and dinner in buffet style (7am to 11pm), PURE Sky Lounge is a resto-bar that serves multi-cuisine items (5pm to 2am), Pachanga Restaurant serves meat and seafood in Middle Eastern style (6:30pm to 11:30pm), Studio One Bar is the sports bar that serves alcoholic and non-alcoholic drinks (4pm to 2:30am) and Wavebreaker Beach Bar & Grill serves charcoal BBQ items (10am to 10:30pm). Recreational activities in Hilton Dubai Jumeirah Resort include a large swimming pool fitted with sunbeds and umbrellas and a fitness centre that offers up-to-the-minute machines and equipment. Other activities close by are: bowling (16km), ski Dubai (12km) driving range (4km), golf course (4km), horseback riding (11km), scuba diving (40km), snow skiing (4km), Aquaventure waterpark (14km), desert safari (50km), skydiving (1km) and Wild Wadi Waterpark (9km). One child under the age of 12 years can stay free of charge.